Looking to get a great deal on your next flight? This airfare shopping engine uses ITA Software by Google, ITA is a tool that powers other traveling sites like Kayak (http://www.kayak.com/). Matrix is great for booking open-jaw tickets. You can’t buy your tickets through Matrix, but the site gives you the tools to find what is available, and the codes and information to follow up with other sites or agencies. Its mobile version – OnTheFly – is downloadable in the App Store and Google Play. Skyscanner has been in business for 10 years, its flexible search options let you browse through prices across a whole month, or even across a whole year. This means that you can browse the calendar for the best deals. The website lets you book directly with an airline or travel agent, letting you book a flight for the lowest price, with no extra fees. 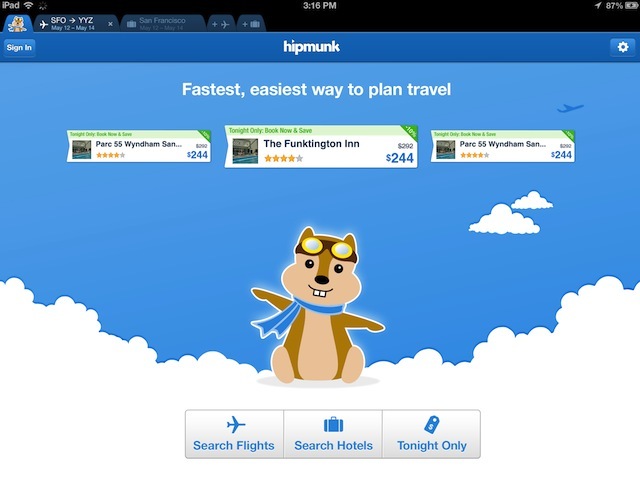 With its headquarters in San Francisco, Hipmunk launched as a competitor to established sites such as Kayak and Expedia. It is a hip travel-booking site that is fast, user-friendly, and looks awesome (it even includes a cute mascot). Their easy to use interface lets you compare amongst your search results and their travel search options range from commercial flights to charter flights and even to trains.